I could go on and on. But seriously, the best part about this method is that everything you need is right in your kitchen and closet…or worst case—the thrift store. 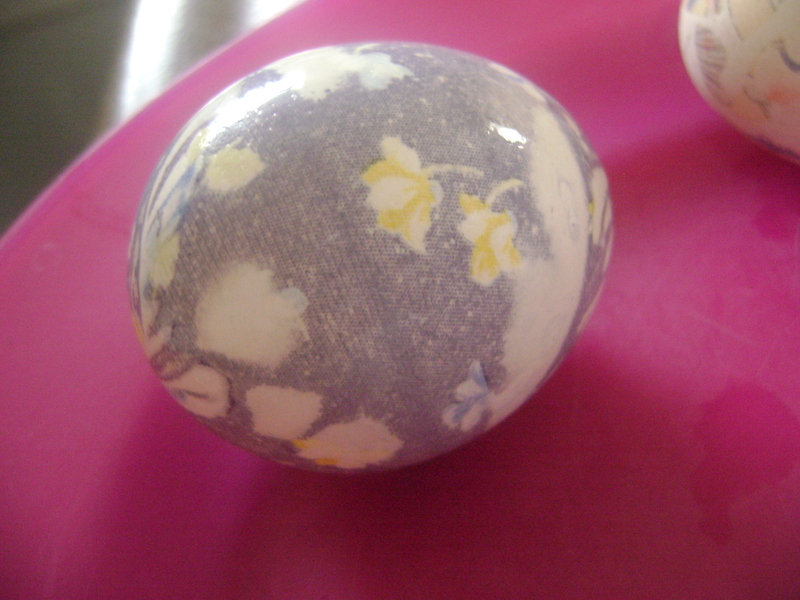 Who would have thought that an old ratty, out of date silk tie could be the gorgeous answer to the annual Easter egg dying ordeal? 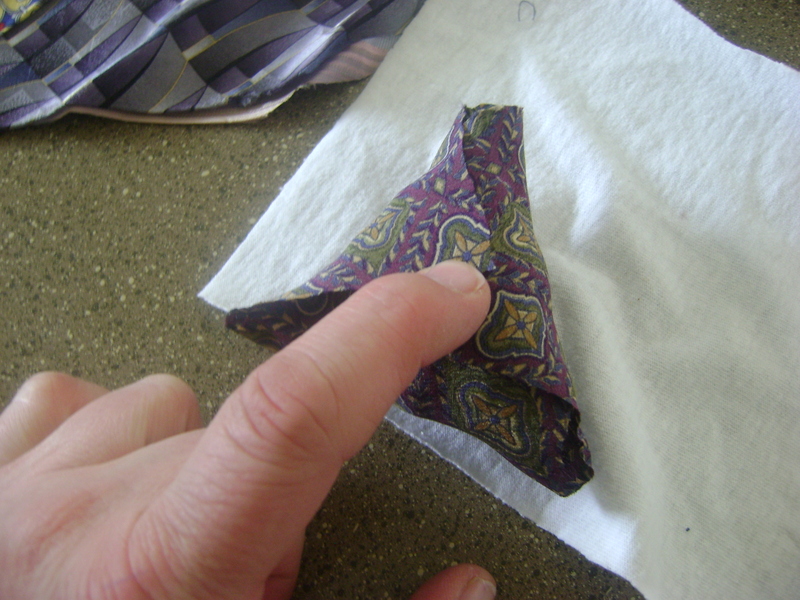 Silk ties–look for a tiny tag at the small end of the tie. It needs to say 100% silk. Seriously, this doesn’t have to cost a mint. We picked all these up at the local thrift store–for just a few bucks. 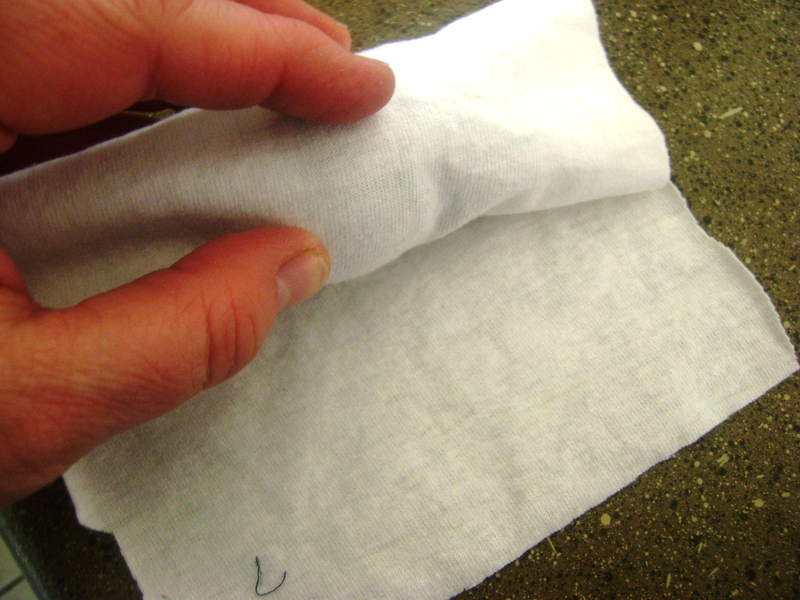 The thinner the fabric the better the transfer. If you’re raiding the closet, please be sure to get your man’s permission before you start cutting things up. ;} Oh, and if your tie is from China–don’t eat the egg. They have different standard for their dyes and many are not safe. SO, in that case just enjoy the egg and toss it out after Easter. Got that? Wrap it around your egg. Don’t get to0 nutty about this step, just do the best you can. 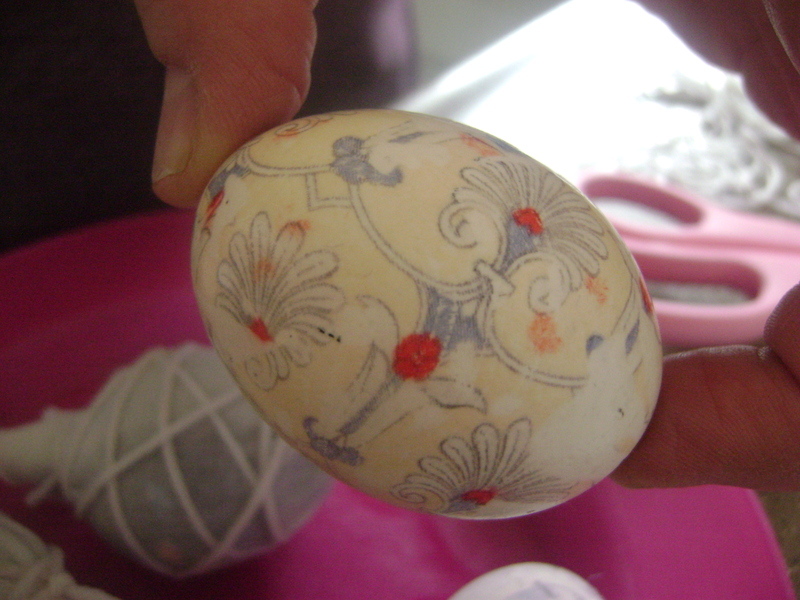 The idea is to press the colored silk right up against the egg. The bald kid and I had a competition to see who could wrap their eggs the purtiest. I totally won. and allow them to completely cool. 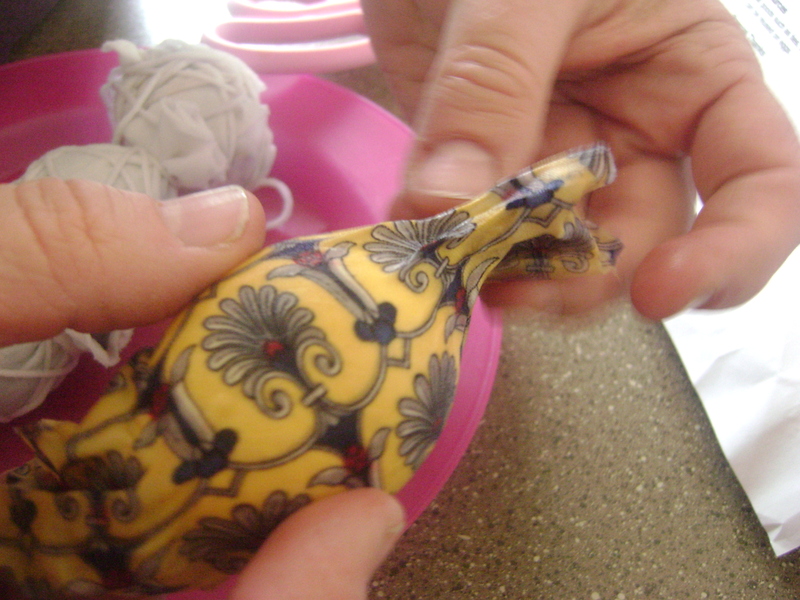 Now the fun part—unwrapping the eggs to see what you’ve got. Rub a tiny bit of vegetable on your masterpieces and see how pretty they look. Even the subtle ones are beautiful. If you’re like us–you’ll want to make a million more–because it’s so easy and there’s just no mess. You can use the fabric more than once–if you’re so inclined. And remember to check out the sweet Bunny Wrappers right here! WOW I love that! Such a brilliant idea. And seriously–no mess! I’ll never go back to messy dyes. This was just so dang fun. I soooo love this idea! I will be on the lookout for silk ties now. One year I was sure that we had egg die and when I searched we did not have any in the box, so I improvised and we painted with finger paint and rolled the eggs between our finger paint painted hands. The result was very pretty. We will have to try this one now. Thanks for the great tutorial again. Always loving your ideas. That’s a really good idea! Does the silk fabric just release the dye better? This is sooo COOL!!! 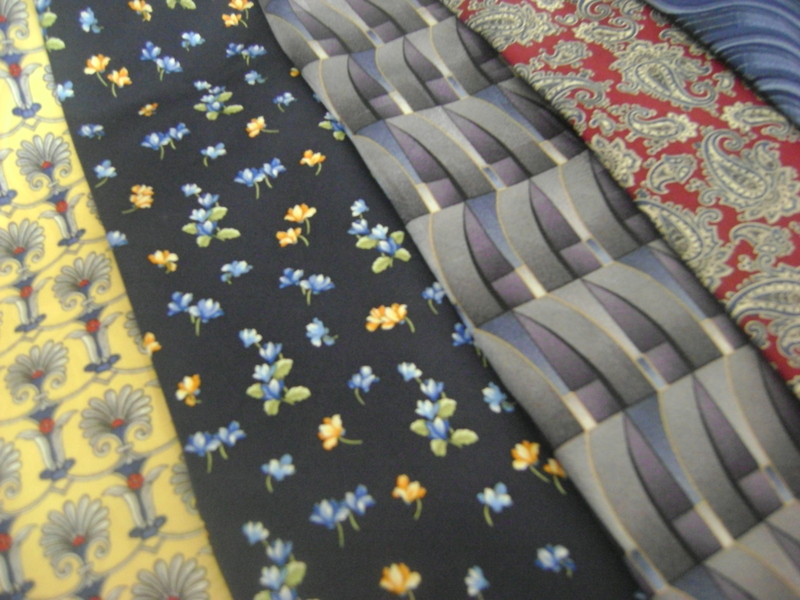 *:D* Now when I see a cool tie, I’m going to have to turn it over and see what it’s made out of! 😉 SO fun!!! Oh look! There’s me 🙂 Thanks for the birthday wishes. Definitely a different feeling birthday this year. We are doing fine though. Love ya! Seriously, check the dollar stores and thrift shops. That made it really fun. Yeah–just make sure they are on a rack–not a person! Hello my dear friend. Are you really? Have you run out of food yet so that we can bring you something? It’s been good to read Kali through everything…she’s incredible. I’d love to see you. I love this! Absolutely must try it out…and I’m Jewish!! Haha. Can you eat the eggs? My son-in-law is Jewish too. But pretty eggs are just more fun. I do remember on the Martha Stewart site where she talks about this she says, “Cook the eggs five minutes longer if you intend to eat them.” No idea why though because boiling for 20 minutes certainly cooks an egg well enough for us. Oh–believe me, I didn’t come up with it. I’ve seen this kicking around for a couple of years online in several different places. The whole time, I wondered if it could possibly be as easy as it looked. The good news is that it was! What else could this work on besides eggs? Have you considered the possibility that ties from the dollar store, probably made in China, might have been made using dyes which contain things like lead? Sorry to rain on the parade. Thank you–thank you for pointing that out. 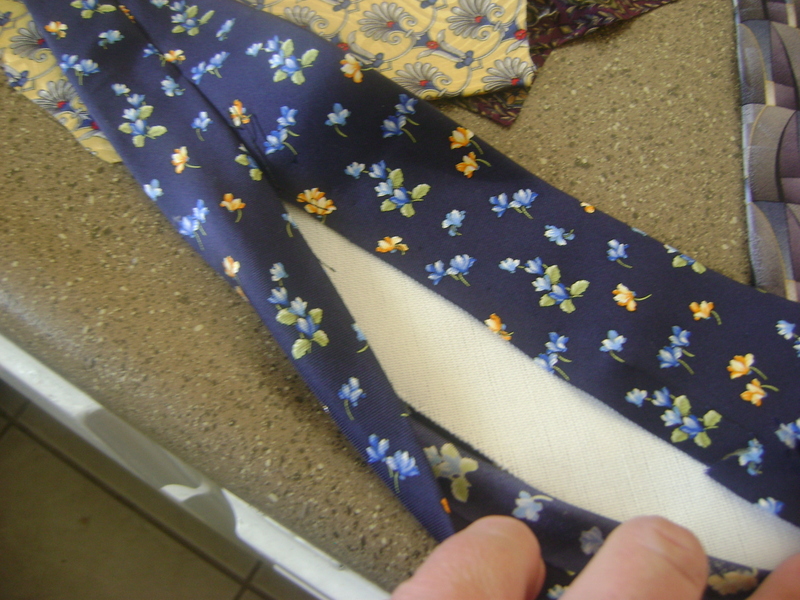 I’ve changed the post to read–thrift store, rather than “dollar store.” We were working with mostly Bill Blass ties. If the ties come from a scary place–I would probably then choose not to eat the eggs. if you boil the eggs for 20-25 minutes won’t they be terribly overcooked? It only takes ten minutes to boil an egg. Well, I didn’t want to eat them…but my big, old son did, and he said they were fine. I’m with you though…if I’m going to EAT it, I’d like it not to be as tough as a boil owl. 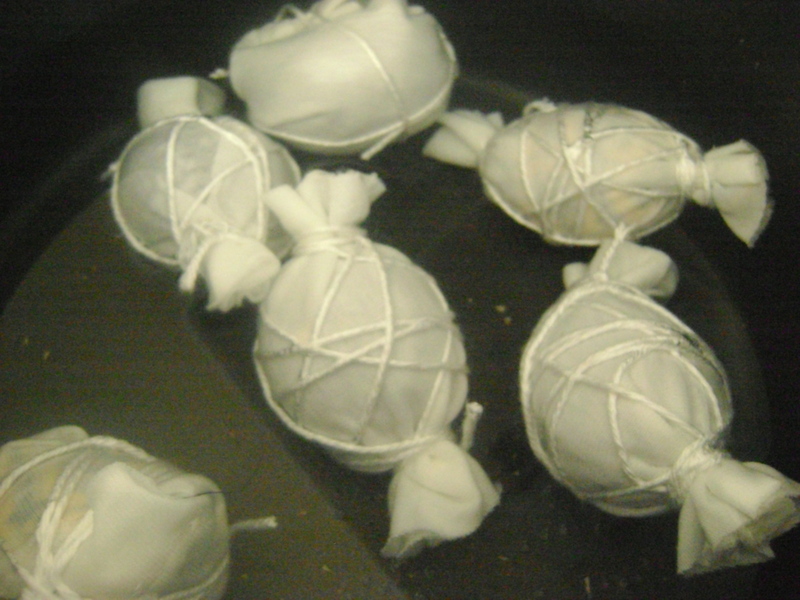 But in this case–I think it takes that much time to transfer the dye. “The bald kid and I had a competition to see who could wrap their eggs the purtiest. I totally won. Okay, I get that this is a “joke”, but really, I’m incredibly disappointed that you are passing these gender stereotypes on to your kids. Everyone is good at individual things, and they don’t have to be based on gender. Would you have told him that he was less of a boy/man if he had done better than you? Oh… it’s a shame you don’t know the bald kid in real life… because then you would know how well adjusted really he is (and how NOT a kid he is). You might not appreciate Launi’s joke… but I know she didn’t say that to set off any equality alarms. Just remember before you come into someone’s life/blog, you have to remember there are probably things to you say and do that others don’t like, don’t appreciate or understand. 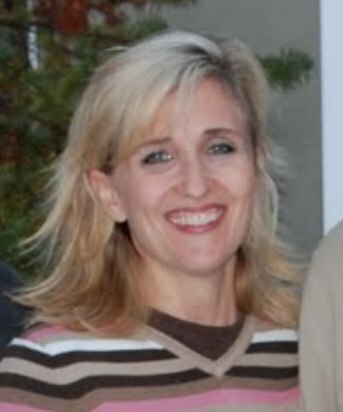 Just a blog. No children were hurt in the making of this post. Have you tried this with blown eggs? I’m guessing they break during the tying process? No, I haven’t. They would be pretty darn fragile and since they need to be boiled–I can’t see how it would work. If the wrapping plugged up the holes in each end they would never stay underwater. Just saw the post via Stumble and had two comments: 1) Love this and will be doing this next Easter… or next time I have to entertain a bunch of kids (I’m thinking Birthday party themed.) 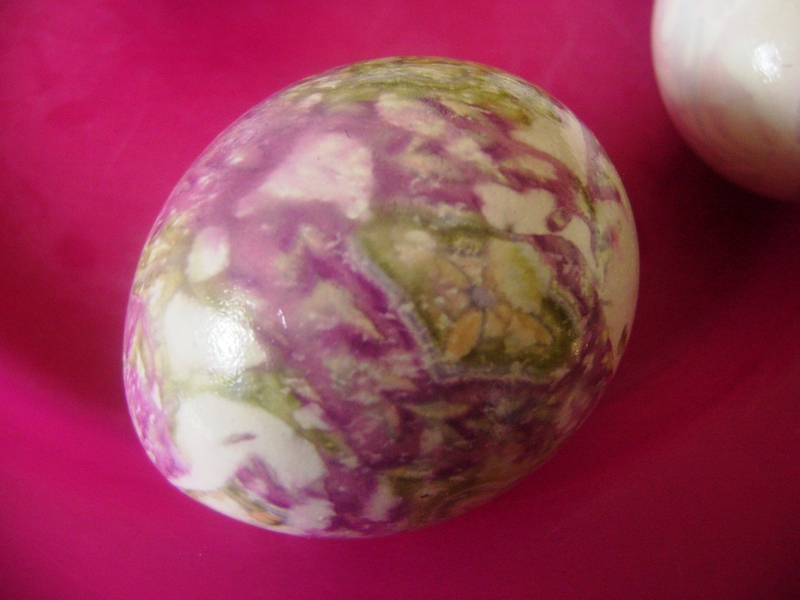 2) My mom did Ukrainian eggs when I was younger and we always blew them out after they were dyed. But those you don’t boil now that I think of it. What if you hold them under the water when it’s cold until they fill up with water, then boil? China is a scary place? As far as lead level in the dyes that they are allowed to use–and possibly ingesting it–yes. In regard to beauty and culture and people–of course not. I have no idea. 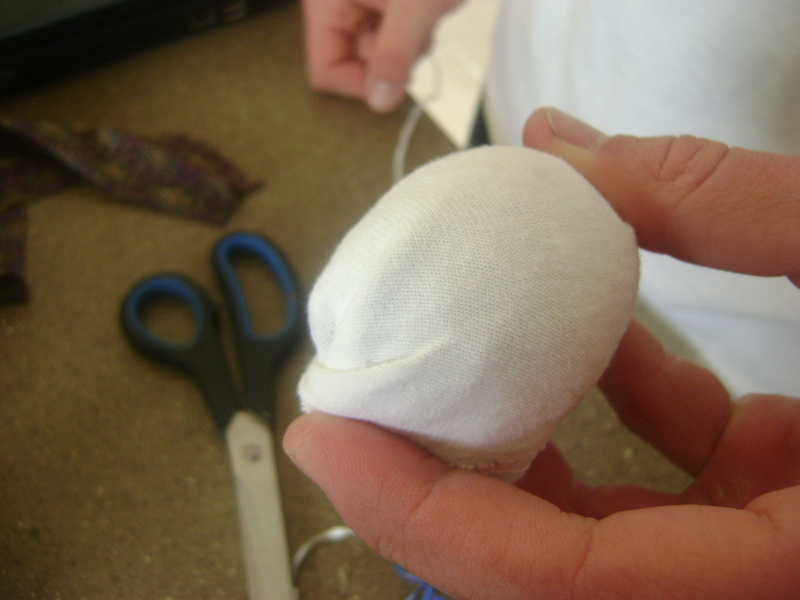 The shell is the magic–hard but porous thing here. Hmmm…. This is incredible!! 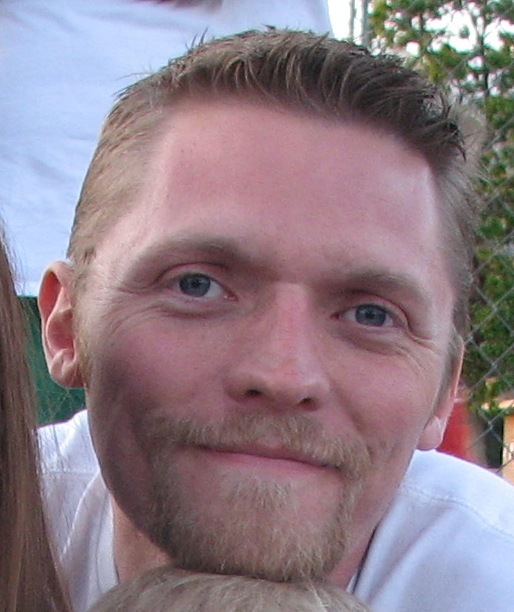 I’m writing from bulbinblue.com, a new, non-profit website for creative ideas and crafts. We’d love to feature your tutorial (text and pictures too) in our Holiday section. If you are interested, please e-mail us at the address given! Hi, found this post via Stumbleupon. I love this idea – your eggs turned out wonderfully! 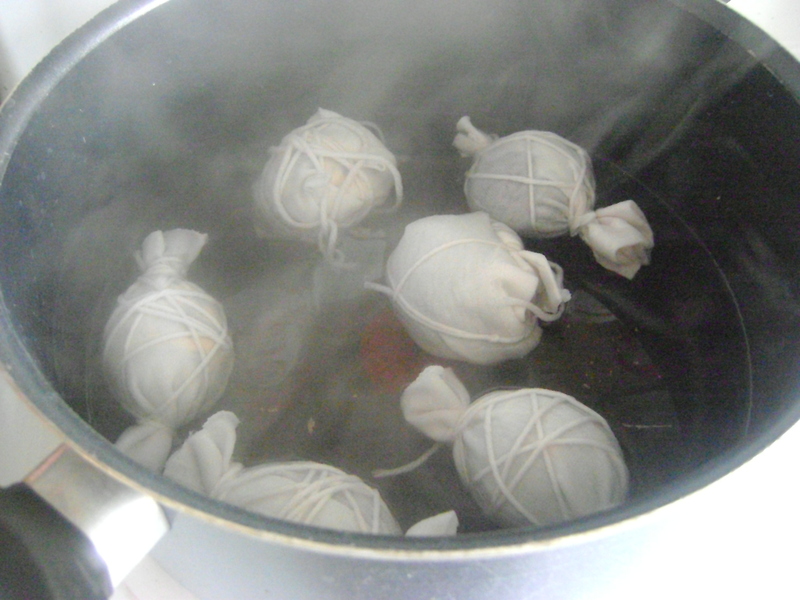 It’s been a while since I’ve practiced dyeing, but the types of dyes used to dye silk and other protein fibers are called acid dyes – vinegar is used to help the fiber take up the dye, but it also allows the dye to be released – thus the dye from the silk is imprinted onto the eggshells, which the silk is tightly bound to. That’s the basic idea, anyway. I was taught to never use the same utensils from dyeing for cooking or eating. Fabric dyes are not food safe dyes, they can be quite toxic. However, without continuous repeated exposure you’ll probably be fine. 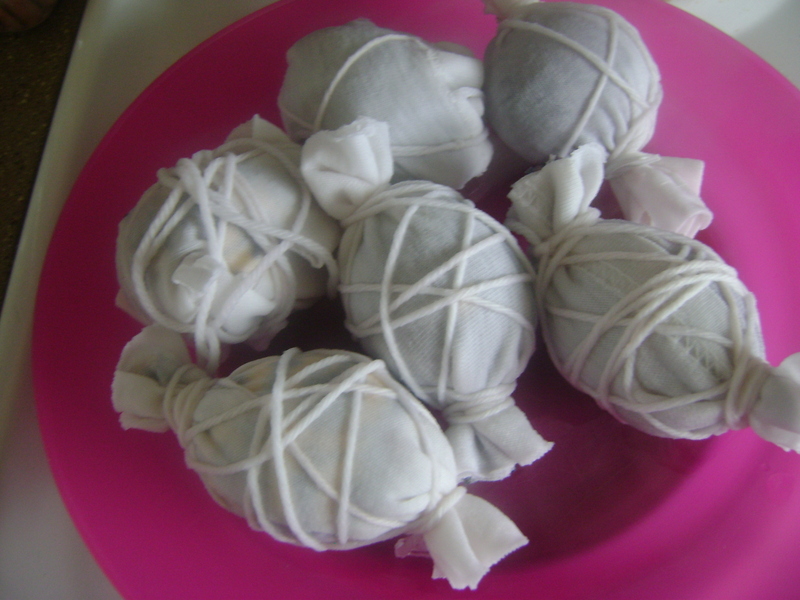 If you want to be more careful the next time you do this project I would advise against eating the eggs, using a dye pot and utensils you will not use again for food, and avoid handling the eggs too much afterwards, as dye may still be able to leach out onto your skin. Thank you so much–you are very sweet to help me understand all this. I’ll add a bit more safety tips into the post. Sincerely, thank you for sharing your knowledge to help all of us be much safer. Hi! Love this post, what a great idea for beautiful eggs… I can give a little insight on why this technique works. Silk is an animal fiber. You dye animal fibers with acid dyes, which are activated with heat (either through boiling or steaming). 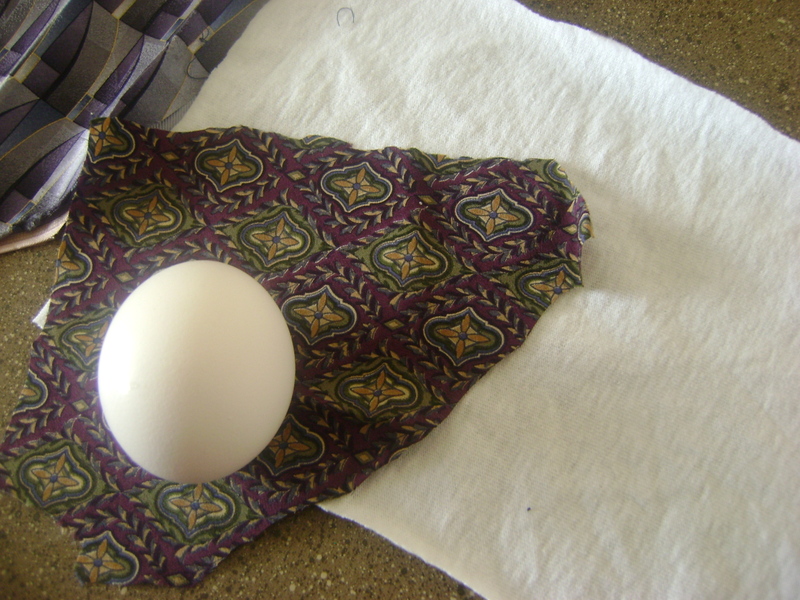 My guess is that since silk ties are not often laundered, there is still some excess dye on the ties, which is reactivated by boiling and thus transferred to the egg. You should be able to use the same ties again and again, until the dye is exhausted. I love this idea! Now I think I’ll dye some eggs for Easter…even though I don’t have kids. Yes…yes. They met with an untimely demise. But repurposing is a good thing. I’ve blown eggs and boiled them in onion skins many times. The weight of the wet fabric around them pretty much holds them mostly underwater. I think your idea here is terrific…but there is only one tie in this household and it’s twenty five years old, ha, ha. I’ll see what I can find online. Thanks for the post. I so love this idea. I showed the hubbs and he went right to his closet and said you can have this one and this one. Isn’t he supportive?? I have a few questions. 1. Does this make the egg not edible anymore?? 2. If I wanted to do this on something that would last and not spoil could I use maybe plastic eggs or another type of white figure or something or is it the egg shell that makes it work? Thanks for the great tutorial. I am happy to be following you now!! Honestly I wouldn’t worry about the eggs spoiling too much. 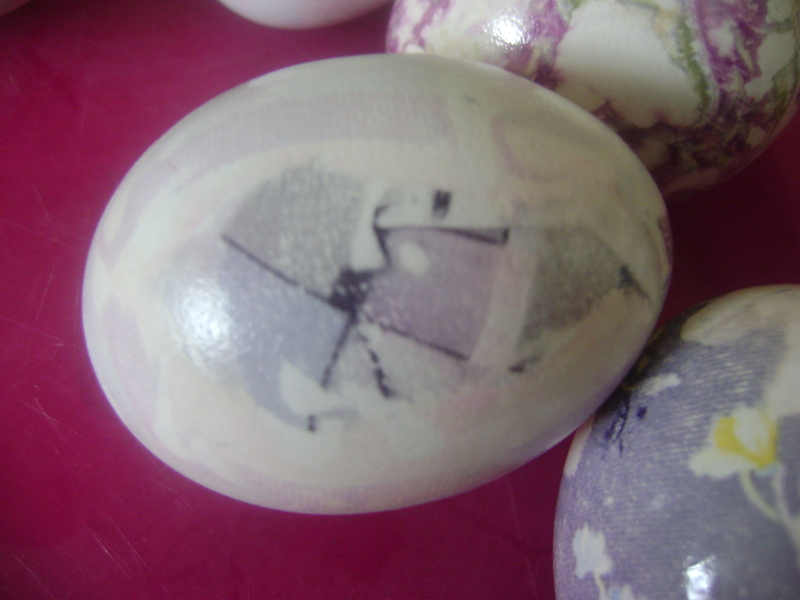 My first husband and I used to color an egg our first few years together that was uncooked… After our divorce (11 years later) the eggs were fine. I eventually did throw them out. Uncooked the white will evaporate through the porous shell and the yellow hardens into a ball that will rattle. Surprisingly there was no odor. I imagine if they broke there would be but they looked great displayed on a shelf! This very clever idea makes so much sense, as it takes advantage of one of the basic properties (and faults) of silk fabrics. I love this . . .. question: do you hard-boil the eggs first? considering you’re going to be boiling them again? 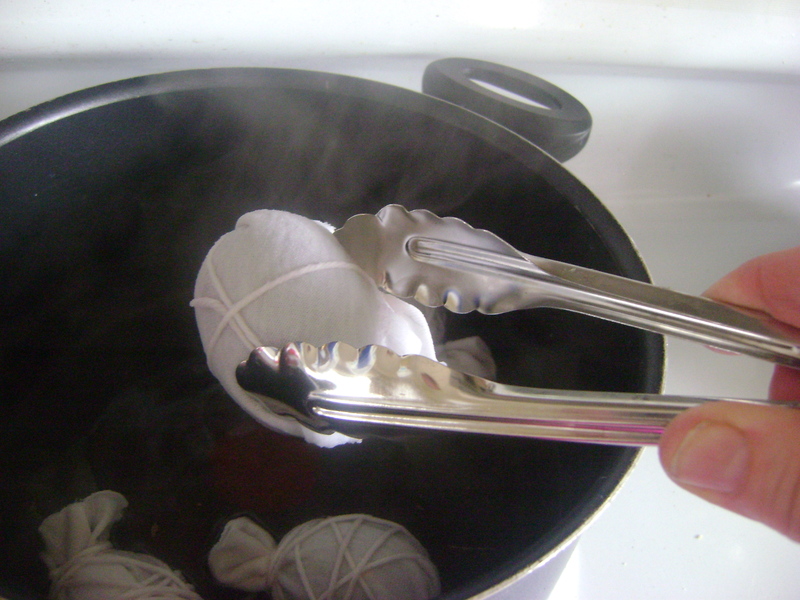 ….double boiled? 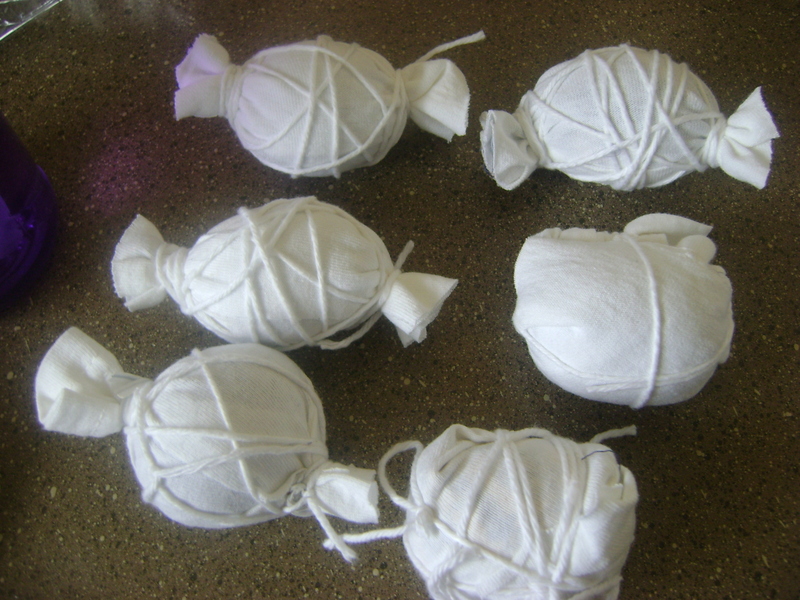 or do you wrap the fabric around the raw eggs? 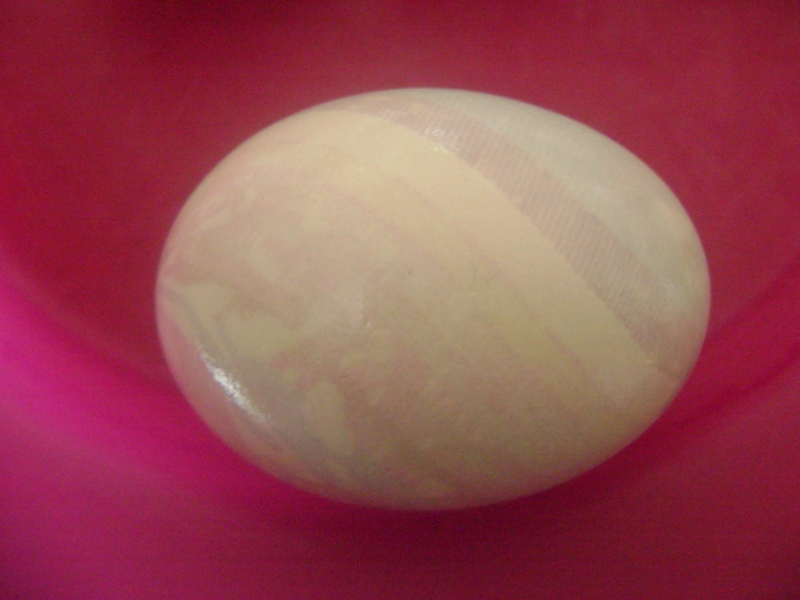 Pingback: an egg of a different color « here is hoping. Thanks for sharing this, you did a great job!